Digimon: System Restore: Fusion Episode 13: Mikey, Warrior of the Light! In this episode, we learn that Reapmon once slaughtered an entire order of holy Digimon and that he's actually a good guy. One of the hallmark moments of season one is Wizardmon sacrificing himself for the sake of Gatomon's happiness. While heroic sacrifices are fairly common in the franchise, none of them quite hit that same emotional apex. We'd be lying if we attempted to put Reapmon protecting Mikey on the same pedestal. It lacks the passion, the consequence and that single money shot that captures everything perfectly. But it's worth calling up. Partially to demonstrate that the biggest punch we've had thus far still comes up short. Partially because in terms of development, Reapmon's story completely wins out. Remember that Wizardmon was a case where the moment was so good we all forget that the buildup to it was flawed. 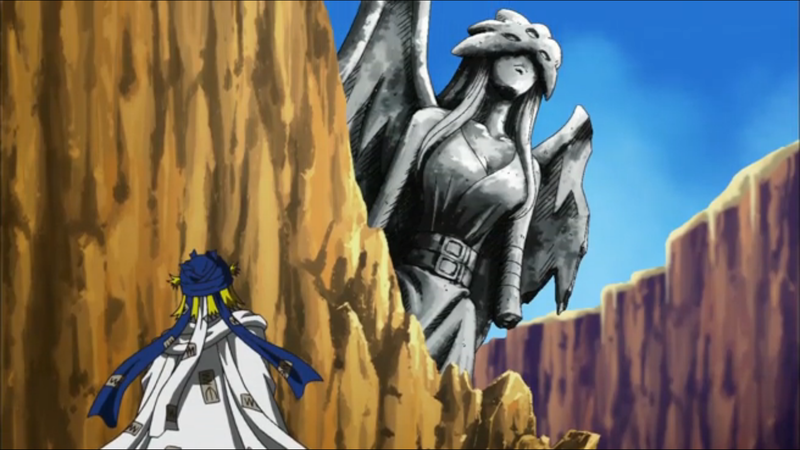 Wizardmon was never properly seen in any context other than an accessory to Gatomon, making it no real surprise that his loyalty lied with her rather than Myotismon. His entire purpose was solely as a catalyst to Gatomon's turn, and his final sacrifices were a good exclamation point. It turned out great in the end, but at no point was the story ever about him. A shame, because both his position and disposition was secretly even more interesting than Gatomon's. Contrast that with Reapmon and you see what we could have had. His loyalty lies not to the Bagra Army that he serves, but to the Warriors of Light that he loved, but never fully accepted him. Like Wizardmon, this allegiance drives his character. Unlike Wizardmon, we get to see him operating as a bad guy. Not only that, but a nasty one that always seemed to strike whenever the good guys already have their hands full. We see him wearing the mask, avenging Angemon by doing things his tutor would never tolerate. That means we also have to give credit to the Bagra Army for being leery of this guy. Myotismon never seemed to give much thought to including Wizardmon among his ground troops, but the three generals knew better than to fully trust this guy. Whether they knew his past or kept their distance because of the whole reaper thing (which, while never said, was a likely factor in never being accepted as a Warrior), it creates a believable tension that makes for a nice payoff. Ironic too that Laylamon was the only one of the three willing to incorporate Reapmon into her plans, since she was the guilty party. While Reapmon's story doesn't hit the emotional high of Wizardmon's sacrifice, his turn from the Bagra Army is plausible and even a little bit tragic. Reapmon gets in with the bad guys in an effort to avenge his fallen order, only to realize that his effort at vengeance is close to killing its newest member. It's a nice development, but he should probably show a little more grief in realizing what he was about to do, and really had been doing the whole time. It's a pretty big deal that he's switching sides in order to protect Mikey, compounded by the regret he may feel in straying so far from the order's cause and the jealousy that Mikey gets chosen and not him. Even if the outcome is the same, we should be more privy to his decision-making process. As great as all this is, you have to wonder why we not only learn about Reapmon's past, but we're instantly confronted with the six-fingered mon who cursed the warriors. That's the sort of thing that can stretch for a whole series. Glad they didn't, but it almost moves too fast. He goes from being a bad guy to honorable to a good guy to a sacrifice in a heartbeat. Add in the Fusion Fighters getting cursed and it's all a bit much. Now think how crowded it would have been if Blastmon, Nene and Christopher had actually bothered to finish their fight. Pretty sure this is the first time Nene's team was properly addressed as Team Midnight (a change from the original Team Twilight). Unlike the change to Mikey's team, I like this better. Given such a sharp departure, it really doesn't feel like a continuation of the previous episode, despite being in the same zone. Pharaohmon's back in his tomb and we probably wouldn't even notice Deputymon if it weren't for his paint job in the dub. It is pretty amazing how quickly the Blastmon fight runs out of steam. He gets his big blow off and everybody just sort of realizes that there's nothing at stake and walks away. How appropriate is it that Mikey uses Guilmon's digicard to dig a hole? On the subject of thought processes, the hell was running through Reapmon's head when he freaked out and killed all his brethren? That had to have been some pretty dark stuff going on there. I hope there's more. Reapmon joins the Bagra Army to sniff out the culprit. Dorulumon was a trusted lieutenant at one point. One was part of a holy order. One clearly has ethical standards. Is it possible that the Bagra Army is such a dominant force in the Digital World that it takes a while for everybody to realize that they're the bad guys. 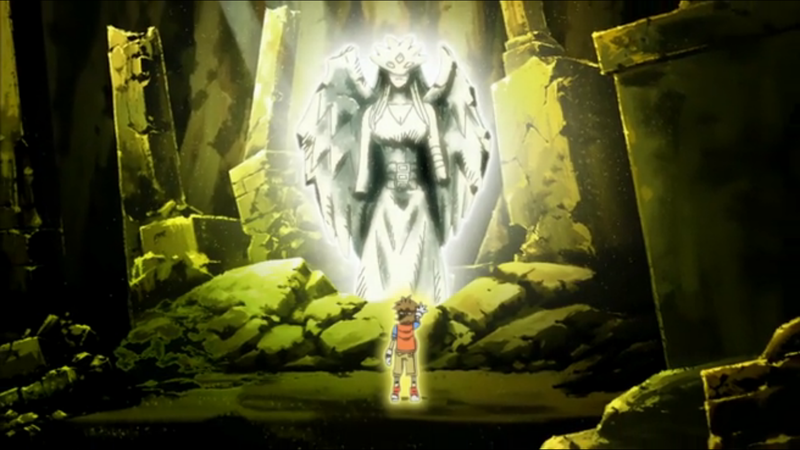 This episode sucked.The dubbing changes were unforgivable.THIS was the episode I decided to drop this dub once and for all.The corny jokes and dialogue are intolerable.Saban has ruined their two great franchises;Power Rangers and now Digimon.Oh how the mighty has fallen. Super Megaforce is becoming a return to form. Just stick around before you condemn the entire series to the scrap heap. Just goes to show that episode 13 is a lucky number for the Digimon franchise. 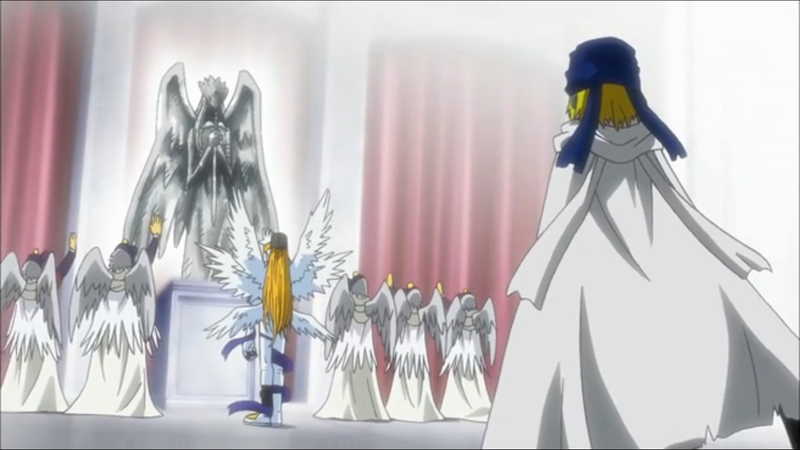 Angemon's sacrifice, the Dark Ocean and what could have been, Juggernaut being unleashed, the story behind the Digital World's condition followed by Seraphimon's defeat, the earliest we've probably seen an Ultimate make a debut and the earliest a Mega level has made his presence felt and now this. Why wasn't Reapermon affected by the crazy spell?